Simple Fourth of July Candle Holder - I Can Teach My Child! I don’t think that I have ever gone this long without posting (or at least scheduling guest posts)! Between taking care of a sick kiddo while Prince Charming was out of town and preparing for our weekend getaway to the lake, I haven’t much free time. If you’re looking for a quick and EASY craft that you can do with the kids over the next few days, this is it! This simple Fourth of July Candle Holder would look great gracing the table at your Independence Day festivities. Here’s what you’ll need: tissue paper, Mod Podge (or watered-down glue), a glass jar, and either scissors or a star punch. 1. Cut out your stars. The star punch actually did not work very well for me. Cutting out a star pattern on the tissue paper would probably work best. 2. 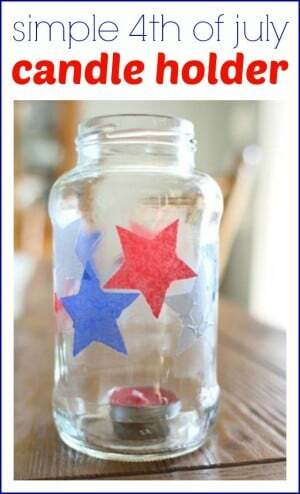 Add Mod Podge to the glass jar (I used an old spaghettis sauce jar) and then place the stars on top. Brush the tops with Mod Podge and let dry. What plans do you have for this Independence Day weekend?